No, I haven’t been spending my lunch hour at work creating poems about staplers and post-it notes, although that does sound like it could be a fun challenge. 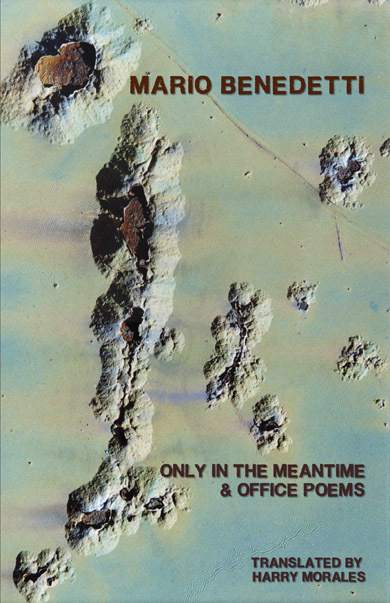 Anyway, I’ve recently discovered poet, Mario Benedetti through Only In the Meantime & Office Poems. According to the introduction in the collection, Benedetti is one of Latin America’s most well-known poets. Unfortunately for me, I had not heard of him but I was very happy to discover this collection which was written from 1948 t0 1956. The Uruguayan poet is well-known for his poems addressing everything from love, political struggles and even the struggles of the middle class office workers. that I pay cash on delivery. You can read the Spanish version here – it’s Aguinaldo. Isn’t that great? How about you, have you discovered any new poems/poets lately? This is awesome–thanks for sharing! Tiffany – Glad you enjoyed it!